Indiasudar Members: Udhayakumar, Shiva, Mr.Gunasekaran, Mrs.Shanmukavadivu and myself. 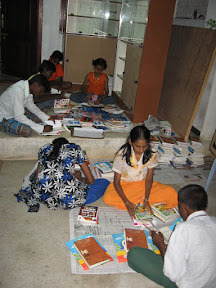 Students from Panchamadevi Village worked along with me to set up the libraries to do the following. 2. Only 142 books were distributed. Remaining books will be given within a week. 8.30 am to 11 am – Government Hr.Sec School,Renganathanpettai,Karur Dt. Inaugurated the first Indiasudar library. Library rules and regulations were explained. Prizes were distributed to the girl’s students to encourage their studies. PTA president explained about our activities one by one. We are able to see his interest on that school. They are in need of a computer teacher. They will arrange computers. 11 am to 1 pm-Government school,Porani,Karur Dt. Second Indiasudar library was inaugurated. Had a discussion with HM, Teachers and PTA president. There are drop-out students from the schools. Very interior area. We have to arrange a counselling session to increase the school strength in APRIL and May month. We should adopt the school to improve the performance. Very interested and dedicated persons are in and around the school. Very good Support and Cooperation. 1 pm to 2.30 Pm: Government Primary school,Mayanur,Karur dt. Discussed about the present education system along with HM,Teachers and our Indiasudar deployed Teachers. Visited all the class rooms. Few students showed their performance in cultural activities. Had a good Lunch at Mayanur HM Mr.Gunasekaran’s Farm House. 1. The remaining libraries will be inaugurated within 15 days. 2. Entire expenditure will be informed in February last week. 3. Future library set up requirements along with the suggested schools will be announced By March First week. 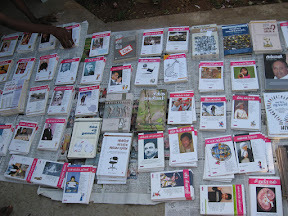 4.Approximte cost per library is around 14000 Rs. India Sudar member Mrs. Sumathi Ravichander told us that there is an amazing English teacher at Govt Higher Primary School, Sorrahumanese, Bangalore, but she is blind and poor. Also, she told us that blind English teacher is working without salary,coz no sponsors. Sumathi and I met English Blind Teacher Ms. Rudramma at Govt Higher Primary School, Sorrahumanese, Bangalore today. She had completed her B.A at NMKRV College, Jayanagar 3rd Block. She is staying with her old parents, her Sister and her sister’s two children at Malur, Karnataka. Her sister’s husband is drunkard and he doesn’t take care of his family. Ms. Rudramma is the only member making money in her family and taking care of her sister & kids and parents. She is the first graduate from her family. She gets up at 4.30a.m and reach Sorrahumanese before 8.30a.m everyday by bus. The Headmaster of Govt Higher Primary School, Sorrahumanese Mr. S S C Mukurthihal picks her from bus stop and help her to reach school. In the evening, Ms. Radhamma helps her to reach bus stop and get into bus. Ms. Radhamma is one of the teacher in that school. Mrs. Rudramma visits this school 3 days in a week (monday, wednesday and friday) and she teachers English (only reading for 6th Standard) and Music (Karnatic and Classical for all classes). She has been working in this school since June 2007. While we were interacting with her, she brought her harmonium and started singing along with that. It was surprise for me and sumathi to see her dedication and talent. And then, she took us to classrooms and showed her way of teaching (English and Music). Students are very interested to learn and follow her. We had interacted with few students to know their learning level. It is really good. She was referred and appointed by BEO Mrs. Nagarathnamma and her salary was fixed as Rs. 3000 per month. One of the well wisher Mr. Krishnamoorthy was paying her salary for sometime, then he stopped paying. And, then HM paid for 2 months, then BEO paid for 1 month and one of the social worker paid for another 1 month. School HM was able to manage to pay her salary until September 2008 and SHE IS NOT GETTING SALARY FOR THE PAST 3 MONTHS. But she is continuing as English and Music teacher in that school even without salary. She is really struggling to manage her family expenses without salary and HM is looking for someone to pay her salary. When we entered school in the morning, it was prayer time. We could see that this school has good infrastructure like building, classrooms, toilet, good and big play ground, mini library, 1 computer and enough sports material. There are 227 students studying from 1st to 7th Standard(Boys – 122, girls – 105). They have enough teachers – 6 teachers. The HeadMaster Mr. S S C Mukurthihal is taking all the initiative to make sure that “no drop out” in that area. He goes to door-by-door to convince parents or to bring back students to schools. He is doing his best. All the students get uniform, books, notebooks and mid day meal. They may need some more books for their library and that is low priority as of now. Ms. Rudramma , BEO and School HM are looking for someone to pay Rudramma’s salary. I’m really impressed by her dedication, teaching and responsibility to take care of her family. Let us know, if any of you willing to contribute for this amazing English & music teacher.